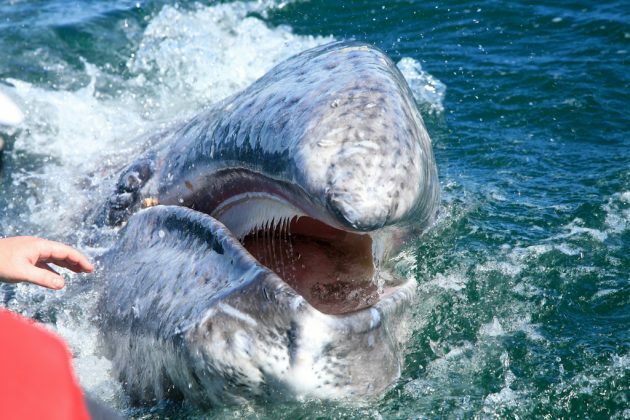 A bizarre change occurs in the mouth of a humpback whale during its development in the womb. Several dozen tooth buds sprout in a row on both sides of its lower jaw then vanish without a trace. Adult humpbacks have no teeth. They eat by gulping massive quantities of water that they push out through a curtain of baleen that grows like a broom from their palate. 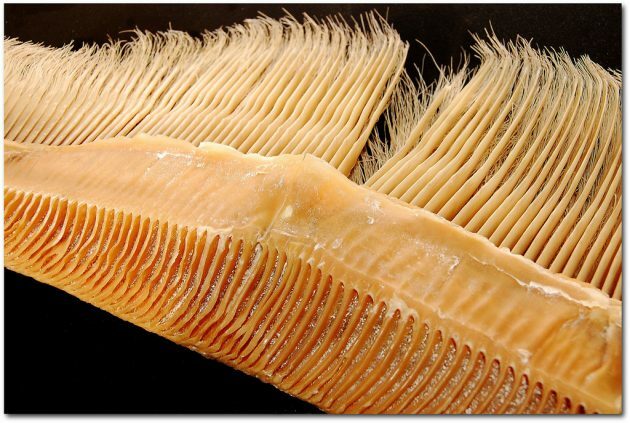 The baleen filters out small fish and plankton that the whale then swallows. Humpback, right, blue, gray and rorqual whales are a few living baleen feeders, also known as mysticetes. Teeth that sprout then vanish in the mouths of humpback fetuses are an ancient vestige from a time when mysticetes were toothy, fearsome predators. 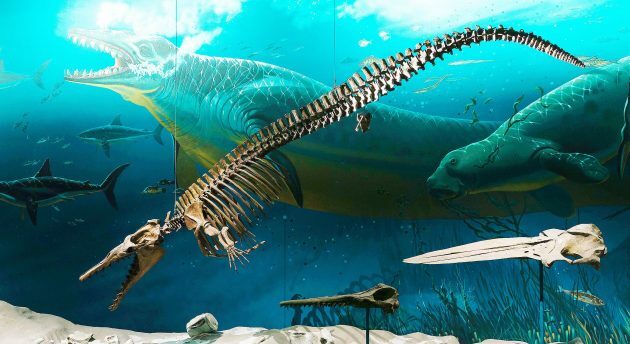 Llanocetus denticrenatus, for example, lived about 32 million years ago in the Late Eocene epoch, was a good swimmer and had a mouth full of large, pointy teeth perfect for catching, holding and dismembering prey. How and when baleen first appeared is one of the great mysteries of whale evolution–a detective story paleobiologists would love to solve. But scientists attempting to unravel baleen’s origins have for years been confronted with a broad and imposing array of research spanning centuries that is filled with difficult-to-follow leads and clues. From a detective’s perspective, the case file on baleen required much-needed maintenance to organize evidence and reframe some fundamental questions. Enter Carlos Mauricio Peredo of George Mason University, with Nick Pyenson of the Smithsonian’s National Museum of Natural History, and Alexandra Boersma of California State University Monterey Bay. In a new paper in the journal Frontiers in Marine Science, these three scientists have condensed, clarified and updated all current knowledge on baleen’s evolution—from studies more than a century old to modern DNA analysis. Their paper condenses existing research and establishes a framework of four different hypotheses by which baleen may have evolved in whales. Each hypothesis relies heavily on morphological evidence from whale fossils. Dental filtration: Filter feeding evolved first and the filtering was done through pointed teeth on the upper and lower jaws as the mouth was closed and water pushed out. Baleen evolved later to increase feeding efficiency. 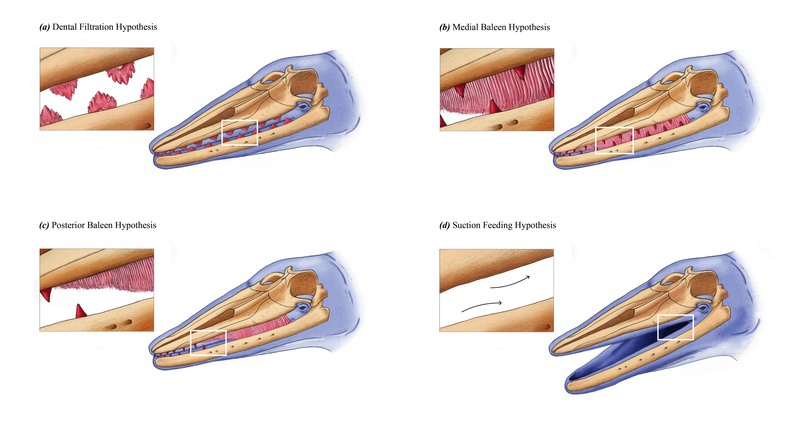 Suction feeding: Whales become increasingly efficient at suction feeding, resulting in the loss of teeth independent from the evolution of baleen, which came later. 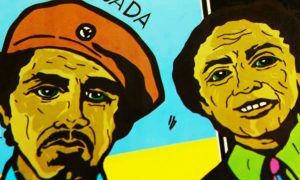 “More than anything, we’ve laid down some scaffolding and some blueprints for how the next stage of research can really progress in a fruitful way,” Peredo says. From their paper, it is clear that a great deal of research remains to solve the complex issue of the rise of baleen in whales. But with its publication Peredo, Pyenson and Boersma have made the odds much better that the mystery surrounding baleen will be correctly resolved sometime in the near future.